Well I can officially admit, I am a pinterest addict! I had to share this recent idea I pinned. 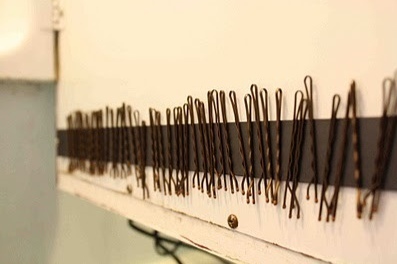 Ever since I could remember I have used bobbi pins. They are all over my house, in every handbag and even throughout my car. This is best idea to keep them from living all over the place. All you need is a magnetic strip and a little double-sided tape. great minds think alike. I blogged about Pinterest today too.